On the eve of the second summit between the top leaders of the US and North Korea in Hanoi, most attention is focused on what might be the concrete substance/steps of North Korea’s denuclearization and the reciprocal measures that the US will offer in return that come out of the summit. In sharp contrast to the pivotal role China played regarding North Korea during the first year of the Trump administration, China’s role in influencing North Korea’s strategic calculus no longer attracts the spotlight. However, the idea that Beijing has been marginalized in peace and denuclearization talks with North Korea ignores the quiet, yet active consultation happening behind the scenes. Beijing’s more backseat role in parallel US-DPRK and inter-Korean talks may fuel suspicions about the marginalization of China in the ongoing diplomatic processes taking place with North Korea. In particular, the direct channels of communication established between the US and the DPRK, now including a possible US liaison office in North Korea, seem to support a narrative of Chinese exclusion. However, judging by Beijing’s recent statements and actions, China does not appear particularly concerned about being sidelined from US-DPRK direct engagement, including the second Trump-Kim summit. The Chinese Foreign Ministry and senior government officials have publicly expressed their support of the summit and hope for positive outcomes. This is consistent with their high praise regarding the result of the first Trump-Kim summit last year. Had China truly felt excluded from the process, Beijing would hardly remain this calm and gracious. Several reasons explain China’s calm embrace of the Trump-Kim summits. The most important is that North Korea has maintained close communication and consultation with Beijing throughout this process. In 2018, the inaugural Singapore Summit was preceded by two visits to China by Kim Jong Un: in March and in May. If the first trip was to repair ties between these two countries on the senior level, after six years of mutual cold shoulders, the second trip—which occurred after the first inter-Korean summit and at the peak of negotiations over the first Trump-Kim summit—was clearly about acquiring Beijing’s buy-in to the summit and consulting over the details. North Korea’s trust of and dependence on China was later attested by the fact that Kim Jong Un flew to Singapore on an Air China plane previously used by Chinese senior leaders and through Chinese airspace. Furthermore, within one week after meeting Trump in Singapore, Kim Jong Un visited China again to debrief the Chinese leaders on the proceedings and results of the summit. This second time around is no different. Kim Jong Un visited Beijing in January, during the negotiation stage of the second summit, reportedly to consult with the Chinese on the negotiation positions and potential outcomes of the meeting. Moreover, another meeting between Kim and Xi will likely happen promptly after the Hanoi Summit. 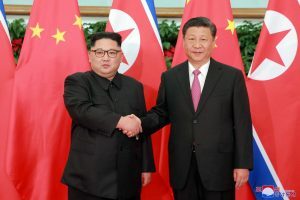 Certainly, Kim Jong Un’s China-dependent travel arrangements for both of Kim’s summits with Trump is particularly reassuring for the Chinese; it does not only indicate the unique status China plays as a facilitator, but also proves to Beijing Kim’s willingness to expose vulnerabilities only to the Chinese, entrusting them with his safety. Despite the fact that China is not a formal participant of either the Singapore or Hanoi Summits, it does not really see itself as excluded from the bilateral negotiation process. Instead, Beijing appears content with Pyongyang’s policy consultation and coordination with Beijing, and confident that any deal that North Korea accepts will not undermine China’s national interests, but will potentially advance its agenda. Besides North Korea’s reassuring behavior, China’s confidence is also based on key judgments about the future and reality of US-DPRK negotiations. The lack of concrete agreement over denuclearization during the Singapore Summit and the underwhelming progress in the subsequent bilateral negotiations indicates to Beijing, as expected, that the denuclearization process will not be a quick and smooth one. As long as the process is gradual and incremental, it is seen as manageable for China, creating numerous channels/opportunities for Beijing to exert influence. Fundamentally, there is still a real trust deficit between Washington and Pyongyang, which prevents the acceptance of a quick denuclearization process. So long as a US security threat remains a top priority for North Korea, China can maintain its position as the guarantor of North Korean security and influence the negotiations. Provided that US-DPRK negotiations do not generate hasty surprises, supporting the Trump-Kim summits is beneficial and almost cost-free for China. Beijing actually considers the progress made in 2018 as a highlight of US-China cooperation, a rare commodity these days. It sees itself as having contributed to the denuclearization process, such as pushing North Korea toward the negotiation table through strict implementation of sanctions in 2017. It also stands ready to provide mediation when negotiations run into a stalemate. Such assistance will inevitably be portrayed and presented as “favors” to Washington when needed. Moreover, denuclearization of North Korea is in China’s interest and has been seen as one of China’s top priorities for Korean Peninsula affairs, along with peace and stability. In fact, China has been eager to take credit for the synchronization of denuclearization and a peace process, tracing it back to the 2017 Chinese proposal of a “dual track” mechanism. Some might see the diversification of North Korea’s external relations as mitigating its dependence on China, therefore undermining Beijing’s interests. However, in reality, the North’s high level of dependence on China has not made it a strategic asset, but a major liability. In this sense, a North Korea with improved ties with the outside world helps alleviate China’s political, economic and reputational responsibility for the North’s future. As long as China still maintains influence over the pace and substance of the US-North Korea negotiations, Beijing may not be as worried as foreign observers speculate. There is a question as to whether China will leverage North Korea over trade talks with the US. At the current stage, they do not appear to be linked. China certainly does not want to take responsibility for any failure of US-DPRK negotiations. For example, in May 2018, when President Trump identified “a change in attitude from Kim Jong Un after his meeting with Xi,” he called President Xi “a world class poker player,” implying a Chinese intervention to change North Korea’s position. Whether or not that was true, the result was that Trump backed away from a trade deal with China on May 23 and canceled the Singapore Summit on May 24 (although the summit was resumed just days later). The lesson China drew from that experience was that the perception of trying to “play” Trump on North Korea may lead to unpredictable and potentially harmful consequences on both fronts. As North Korea has embarked on multiple tracks of bilateral engagements, Pyongyang has been skillful in planting competing narratives of its threat perceptions. For instance, US officials and interlocutors have been told by their North Korean counterparts rather convincingly that China is North Korea’s biggest security threat, based on the numerous Chinese invasions of the Korean Peninsula throughout their long histories, and anchored by disagreements, disputes and resentment between Beijing and Pyongyang in recent decades (especially in recent years). If US policy is based on that conclusion, it is natural to see a pro-US, anti-China North Korea as the most desirable for US national interests. However, North Korea clearly has sent a different set of messages to China. The words and actions of North Korea prove to China that the US is still seen as the biggest threat to its national and regime security, and that North Korea continues to depend on China as its most reliable supporter and friend. The truth is most likely that North Korea is using strategic messaging to manipulate both the US and China, which should not be surprising to anyone. Its manipulation between China and the Soviet Union predated the Korean War and lasted throughout the Cold War. Both the US and China seem confident that they know where North Korea stands in the triangle. Unless they both have a clear understanding of the North Korean message to the other side, their judgment may very possibly be skewed. As the world holds its breath over what will come out of a second Trump-Kim summit, this could be the subplot that leads to serious miscalculations down the road.